We are pleased that a number of new clients have chosen to work with OPCM in 2018. As we analyze new client and prospective client portfolios, a common theme appears in these portfolios – the combination of very high exposure to U.S. stocks, and an overall lack of diversity. It is easy to understand why many investors are highly overweight to U.S. stocks. Not only is the U.S. their home country, but for the last decade, U.S. stocks have been the only asset class to post a return anywhere near its long-term average. The table below shows how extreme the return difference has been between U.S. stocks and every other asset class. 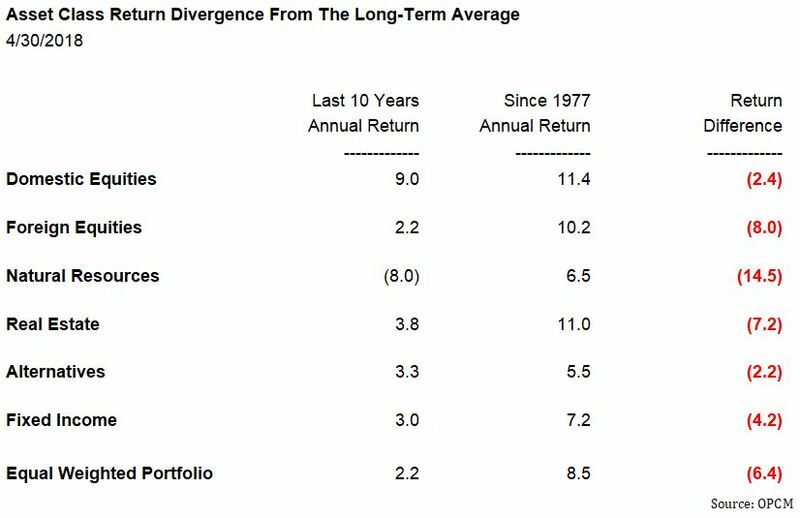 Over the last decade, U.S. stocks have returned 9% per year, which is relatively close to its 40+ year average annual return. However, the second best performing asset class, real estate, has returned less than 4% per year. Other asset classes such as foreign stocks and natural resources have delivered returns over the last decade that are close to the worst decade on record, and up to 14% per year below long-term averages. For example, natural resources are up 6.5% per year on average over the last 40+ years. However, over the last ten-years, natural resources are down 8% per year or 14.5% below the long-term average per year for ten-years – truly astounding. As this outperformance in U.S. stocks has continued over the past decade, recently signs have surfaced that the many tailwinds that previously helped U.S. stocks outperform are reversing. This tailwind to headwind flip, increases the probability that U.S. stocks may underperform other asset classes over the next ten-years…just as investors are massively overweight U.S. stocks. So what are the tailwinds that propelled U.S. stocks over the last ten-years? The table below provides a clear view of not only why U.S. stocks previously outperformed, but why they may face difficulty continuing this outperformance. 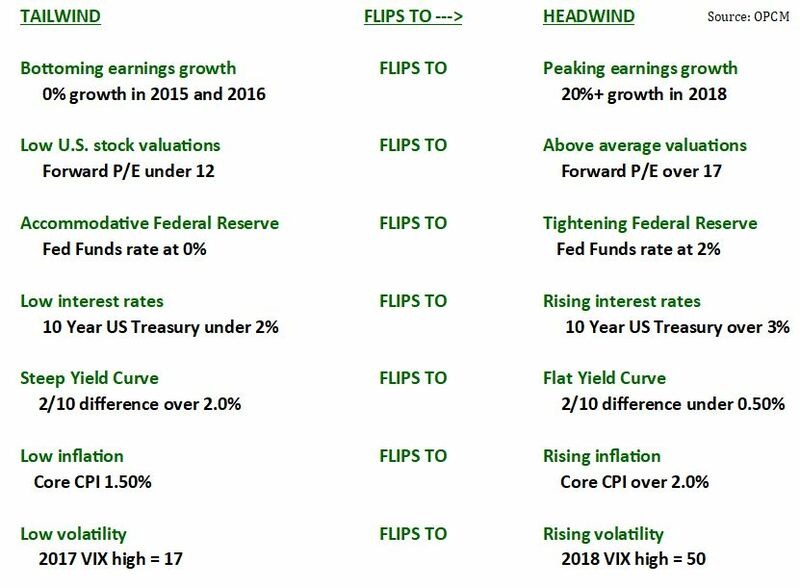 Earnings growth is the first candidate for a tails to heads flip. A few years ago, combined earnings growth for 2015 and 2016 was essentially zero in the U.S. Now fast-forward to 2018, and earnings growth is expected to be up over 20% after a solid 2017. There is also a high likelihood that the first quarter of 2018 was the peak quarter for earnings growth, up 26%. As future earnings growth rates slow, U.S. equities should experience a more difficult environment for further price gains. A second key tailwind was valuation. As we entered 2012, most countries throughout the globe were trading in the general range of 10 to 12 times forward earnings. The valuation differential was fairly narrow all over the world. Today we see a much different story. While developed countries like Germany and Japan trade below 13 times forward earnings, and emerging markets as a whole trade close to 11 times earnings, the U.S. trades near 17 times earnings. The chart below shows emerging markets trading toward the lower end of an 8-16x range, and at a 25% discount to the rest of the world. When the Federal Reserve quickly lowered the Fed Funds rate from over 5% to 0% during the recession, easy monetary policy enabled the economy to bottom, while providing inexpensive financing to feed the next economic expansion. The European Central Bank (ECB) followed suit by taking their overnight rate to less than 0%. While the two have moved in tandem over much of the past twenty years, you can see a divergence over the past couple of years when the U.S. Fed started to increase interest rates while the ECB kept their extreme accommodative policy in place. A chart of this phenomenon is shown below. The shape of the yield curve has experienced a noticeable change over the past five years or so as well. As seen below, the difference in yield between ten-year U.S. Treasury yields and two-year U.S. Treasury yields was over 2.5% at the end of 2013. Since then, although ten-year yields have barely moved, the two-year yield has increased by over 2.0%. 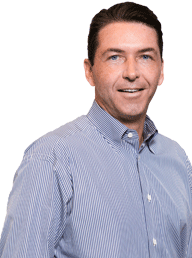 This increase has caused the yield differential to fall to under 0.4%. The flattening of the yield curve is important because history reveals that once a yield curve inverts, a recession is likely six to eighteen months later. Although not a major worry at the moment, the recent rise in inflation off of low levels, and the volatility spike earlier in the year are two additional variables that are potentially flipping from tails to heads. While core CPI and the Federal Reserve’s preferred PCE measurements are on the rise, they have not entered meaningful danger zones. Meanwhile volatility spent the entire 2017 at multi-decade lows, and shocked many when the VIX briefly spiked to 50 in February. Finally, when comparing stock valuations and interest rates within different regions, also known as the Equity Risk Premium (ERP), another divergence is seen. In late 2011, the global economy was bottoming, and markets had just completed a frightening 20% correction. At this time, the Equity Risk Premium, simply calculated as the Earnings divided by Price for stocks minus interest rates, was both quite high and equal in the U.S. versus the rest-of-the-world. The ERP for both was over 7%. Today, while the ERP outside the U.S. is a fairly high 5.5%, the ERP for the U.S. has fallen to only 2.5%. This means the earnings yield for stocks is only a few percent above interest rates, even though stocks are inherently riskier. Equity Risk Premiums are far higher outside the U.S., equating to higher potential future upside for foreign stocks. While we do not believe U.S. stocks are headed for an inevitable 50%-style 2000-2002 or 2008 bear market, we do believe investors who are heavily overweight U.S. stocks will eventually underperform versus an allocation that includes other asset classes with higher potential returns with less downside risk.